Canberra’s tram plan looks suss to me. 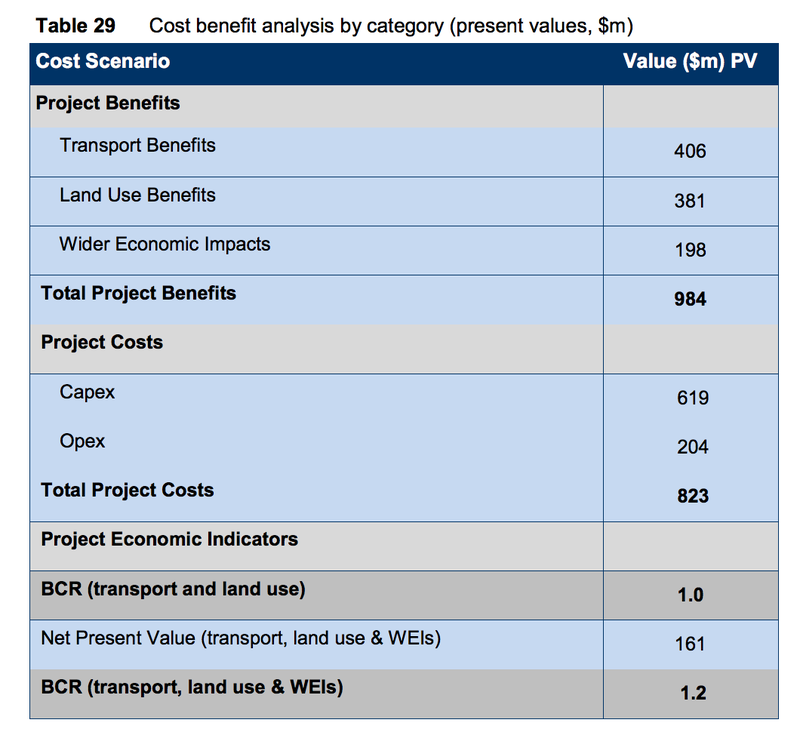 It was with some excitement that I downloaded the PDF containing the full business case for the new Canberra light rail. 1. I love public transport. 2. I like to see open and honest planning. The Victorian government has given us no such insight into their East-West Link plan. But my happiness turned to confusion when I saw the way the calculations had been made. This project supposedly has a benefit-cost ratio of 1.2. But when you look into the $1 billion of benefits, you’ll see that they are a castle made of gossamer. The $823 million of costs look altogether more concrete, and the study estimates a 25 per cent chance they will blow out to be higher still. The most obvious benefit of the tram is time savings. These have been calculated over 30 years, even though the operating contract for the metro is for 20 years. I am suspicious here. If you assume traffic conditions deteriorate at a given rate per annum, you could get the model to show very bad traffic in 20 years time. Including those final ten years might be a substantial source of the time savings. And it goes without saying that trying to calculate seconds saved by tram users in 2049 requires making some heroic assumptions about the way we will live then. The patronage assumptions also look bold. They assume 15,000 passengers a day in 2021. That’s 7500 in each direction, or 416 passenger boardings each hour for 18 hours of operation. If you assume a tram every 10 minutes that’s 69.4 boardings per tram, and if you assume the average passenger goes 6km along the 12km line, you’re guessing the tram will have on average 35 passengers on board. I’ve been on a lot of ACTION buses and that seems like 35 times as many passengers as the average ACTION bus outside peak hour. Time savings are not even the biggest source of “benefits” in this highly questionable calculation. The biggest source of benefits is land use. It is true that the drive into Canberra – down Northbourne Avenue – is grim. I moved to Canberra in 2005, and coming down Northbourne Avenue that fateful day I didn’t realise we were in the heart of the city until it had passed. But solving that by building a tram is a bit like renovating your kitchen by installing a restaurant in your lounge room. Sure, it provides the impetus, but it’s indirect and probably pretty costly. 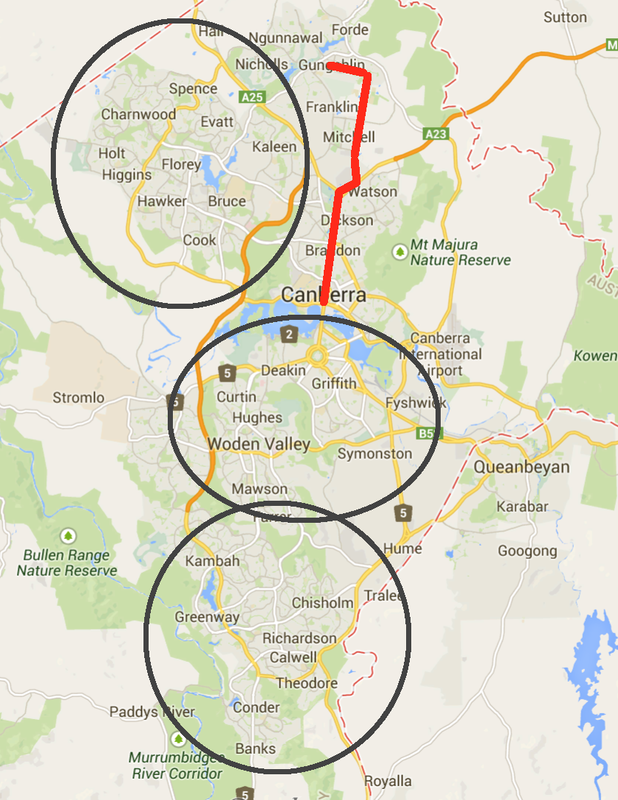 If you want to increase density near the centre of Canberra, the big question should be what’s the best way to do this? But it makes no attempt to say whether those “decisions” could be brought in without the tram. The next biggest source of benefits is wider economic impacts. the availability of Australian specific data needed to calculated wider economic benefits is currently sub-optimal. Therefore, Infrastructure Australia will treat wider economic benefits separately to the traditional CBA. It’s true that the ACT government does two calculations of the benefit cost ratio: with the Wider Economic Impacts and without. But given the project would not go ahead with a ratio of 1.0, the wider economic benefits are obviously key to the calculation. Benefit cost analyses are a GIGO model. You put garbage in and you get garbage out. Even more important than the garbage that goes in is what is excluded. here’s a short list. There is no price paid for the public land on which the tram will run. The tracks will be 6.6m wide. The line is 12km long. If 11km is on public land, that is 72,600 square metres. At $575 per square metre for undeveloped land, that’s $42 million that should arguably be included as an opportunity cost. The tram has priority at all intersections. I see no estimate of how much extra waiting that will mean for pedestrians, cars, cyclists and buses that try to cross its path. Cutting bus services is counted as a benefit, not as a cost. The cost of the funds is not accounted for. Whether raised by debt or taxes, getting $100 for the government to spend does not cost society $100. The cost of the tram plan is equal to $830 million. To put that in context, it’s $2,168 per ACT resident. And most of them don’t live near the 12k tram line. The budget for the entire ACT bus system was $123 million in 2012-13. The reason patronage is low and dissatisfaction is high is clear – low frequencies, badly designed routes and poor service hours. You could double patronage a lot more easily, for a fraction of the cost of the tram, by just improving the buses. Seems that nowadays the government is busy farming out the analytical work that Infrastructure Australia was supposed to do to economics/infrastructure advisory arms that have been hastily put together by the Big Four audit firms. And of course these firms are heavily biased towards giving their tick of approval to potential projects because it means (1) they get more work, in the form of project finance and program management work once construction work starts, (2) they’ll be looked on favourably for future work because the government knows they’ll play ball. This is the first line, not the only line. 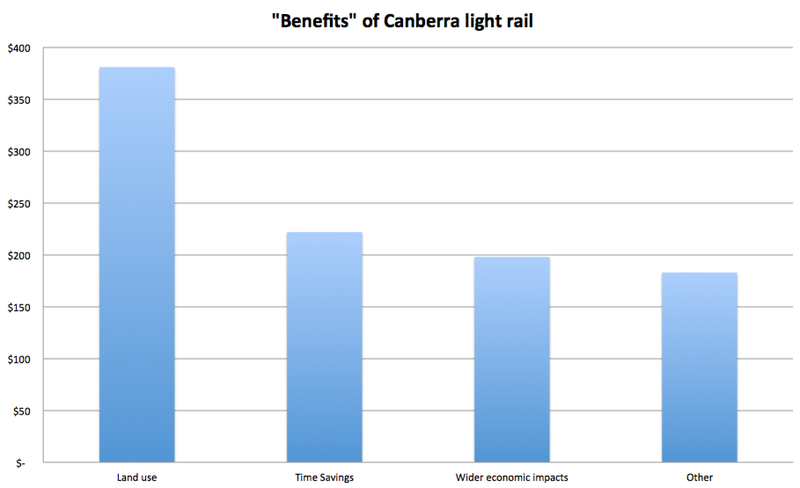 We are seeking to make way for all of Canberra to be hooked up to light rail as per Griffin’s design plan. There has to be a first line. 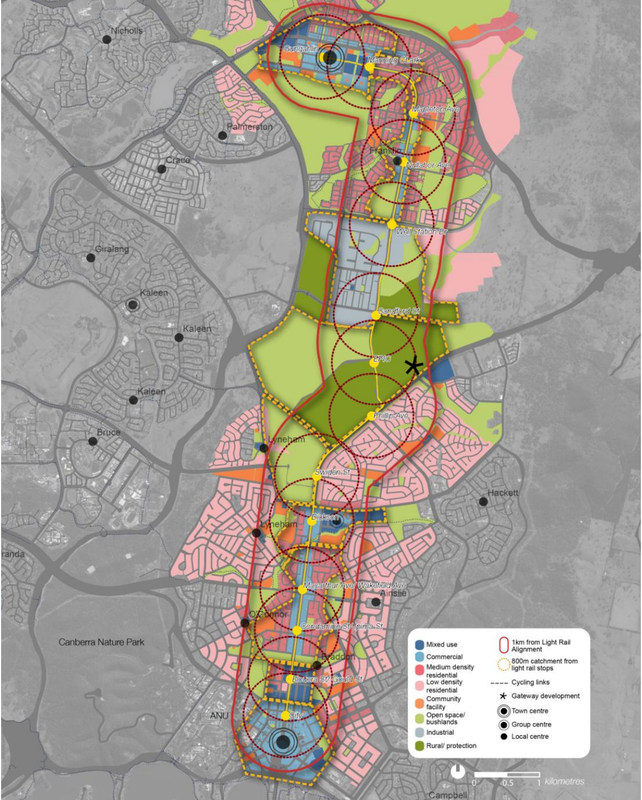 There will be many people not living on the first line however it will service Northbourne Ave – Canberra Central’s main thoroughfare and link Canberra CBD to Dickson – Canberra’s Chinatown through to Exhibition Park. That’s great for business and leisure for locals and tourists alike. This is the start. I would’ve loved to see the first line extend through to the Airport via City Walk, along Constitution Ave with a stop at Russell Offices. Let’s rally for private investment, show support for a progressive National Capital and get all of Canberra decked out ASAP!! Previous Previous post: Myki is set to be replaced. Already. Next Next post: You’ll never guess what happens when you give public servants less work to do.